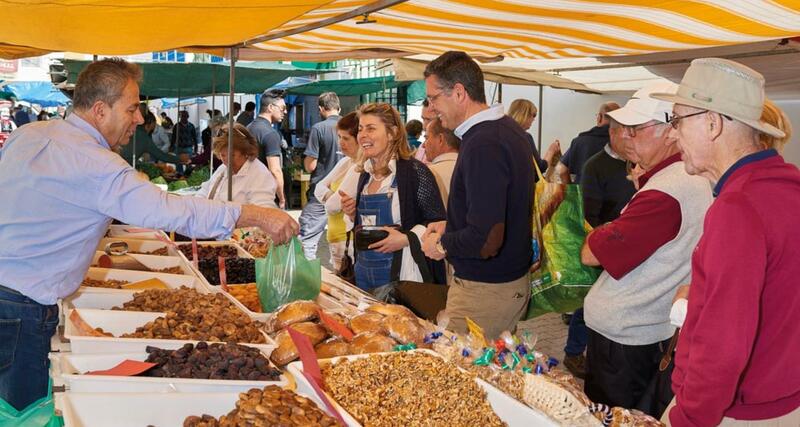 Selling fresh local produce, Saturday farmers’ markets provide a true taste of the Algarve. From inland villages to coastal towns across the Algarve, farmers’ markets are still very much a way of Portuguese life. Every Saturday, the bustling sights and sounds attract locals and visitors alike, in search of seasonal local produce that surpasses anything you will find in a supermarket. Vibrant fresh fruit and vegetables of all shapes and sizes, aromatic herbs, finely cut charcuterie, colourful flowers or the traditional salted cod called bacalhau, the region’s markets have a bit everything, and the atmosphere is as authentic as you can get. 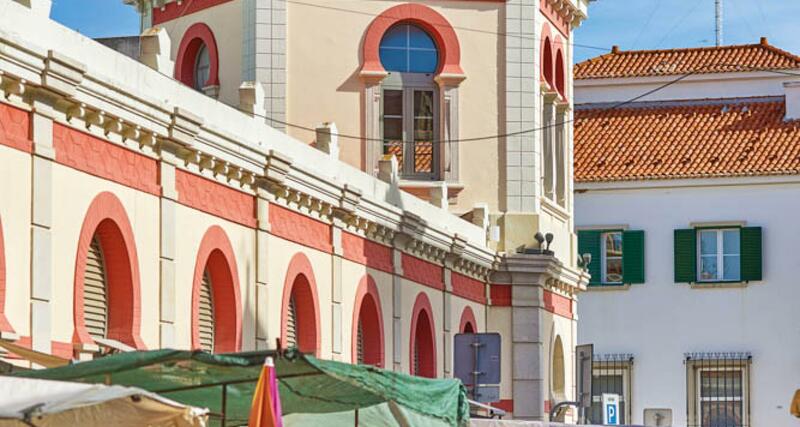 While there are numerous markets across the Algarve, usually held on a Saturday morning alongside the towns’ permanent market halls, two of the best can be found in Armação de Pêra and Loulé. 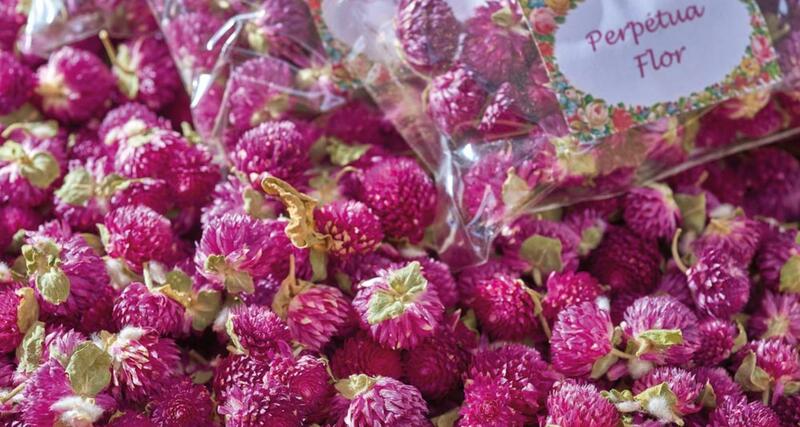 Just a five-minute drive from VILA VITA PARC, Armação de Pêra’s own Saturday market is a treat for those who appreciate quality local produce and a chance to mingle with the locals. The municipal market hall is a plain, modern building in the town centre where one can find fruit, vegetables, honey, jam, meat and freshly caught fish throughout the week. Outside, however, is where dozens of local vendors sell their goods every Saturday morning until around 1.30pm. There are colourful vegetables, fruits, grains and bedding plants – carrots, courgettes, spring onions, potatoes, aubergines, sweet potatoes, onions, tomatoes, cucumbers (including miniature ones), strawberries, raspberries and blueberries, chickpeas and a huge variety of beans and olives –, mostly grown in the outskirts of Silves and Alcantarilha by farmers who have been selling at the market for decades. Like most of the region’s markets, there is also cured ham, sausages and cheeses, fresh eggs, honey (produced in nearby Messines), oven-baked bread and homemade cakes. 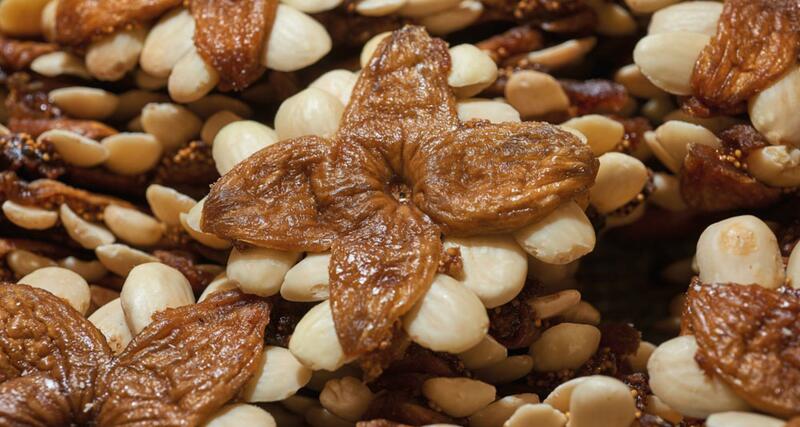 But the Armação de Pêra market particularly excels in the dried fruits and nuts department, with almonds, cashews and walnuts, apricots, dates, raisins and of course the typical Algarvean fig in its various forms. A regional delicacy is the queijo de figo, or ‘fig cheese’, which isn’t cheese at all but rather a sweet made from dried fig (and often almond and carob, too), but sweet-tooths can also find biscuits, tarts and the traditional doces do Algarve (pretty pastel-coloured cakes made of marzipan). In and around the market are many cafés and restaurants, where visitors can have a drink on a sun-washed terrace or order a special lunchtime menu that usually comprises a choice of typical pratos do dia, meaning ‘dishes of the day’. The market is incredibly international and is a firm favourite among foreign residents and tourists. For this reason, while it is easier to park here than at other local markets, it can get very busy indeed in the summer months – aim to visit before the crowds arrive at around 9.30am. Further to the east of the Algarve, the city of Loulé provides one of the most authentic experiences of a regional market. A meeting point for locals and the hub of the community for decades, the market hall dates back to 1905, when it was built in its Art Nouveau style. It has since won several awards, and despite some renovation works over the years, it remains an important landmark for the economic and social life of Loulé residents. The permanent indoor market is open Monday to Saturday until 3pm, with an enormous selection of products and handicrafts inside – the meat and fish (particularly the shellfish) are highlights. On Saturdays though, local farmers arrive at the crack of dawn in preparation for the hordes of visitors that come here purposely, whatever the weather. This is a producers’ market at its best, and both vendors and buyers have been coming here for as long as they can remember. Arquibaldo Rodrigues, for example, a cheerful vegetable-grower, has been selling the plants he grows near Alte for some 35 years. His wife sells fruit at the stall around the corner, and his brother-in-law specialises in aromatic herbs and bedding plants next door. They know the locals by name and are keen to show off their produce to the foreigners visiting for the first time. A must for foodies, the forte of this Saturday market is no doubt the vegetables and the fruits, some grown organically but each one brighter and more succulent-looking than the last. Fat tomatoes, bright peppers and oddly shaped pumpkins sit alongside spring onions, sweet potatoes, beetroots, courgettes, leeks, broad beans, pink and black radishes, strawberries, melons and blueberries; all the colours of the rainbow are on display along the dozens of stalls. Indeed, colour abounds at every corner, not least at the flower stall that’s bursting with hues of pink, orange, yellow, purple and white, in the form of roses, carnations, snapdragons and echeveria plants, sold beside traditional wicker baskets. Be sure to visit during the spring or summer time when the flowers bloom in all their glory. There is an enviable selection of aromatic herbs and plants, too, with the smell of coriander, basil, mint, rosemary and pennyroyal hinting at the many varieties available. At one particular stall, these herbs and many others are mixed carefully by Marta Lourenço, who grows them in Santa Bárbara de Nexe to be used in cooking (the most popular is the Mediterranean mix of oregano, rosemary and thyme) or in tea form. With blends such as ‘anti-inflammatory’ and ‘digestive’, the most popular teas are those that aid sleep – the ‘Bons Sonhos’ (sweet dreams) mix comprises chamomile, lavender, lemon blossom, lemon grass and orange blossom – and Marta notes that she often gets doctors buying her teas for their anti-inflammatory or cleansing properties. Also harnessing the healing power of nature is beekeeper José Martinho Rodrigues, who, alongside the jars of rosemary, lavender and arbutus blossom honey produced in the Loulé hills, sells propolis, a “bee glue” that is a natural antibiotic and is said to fight infections and heal wounds. As well as in the honey itself, this health balm is also sold in its pure form in small droppers – it can be added to food or applied directly to the graze or wound. The rest of the market provides the usual Algarve treats: dried fruit and nuts, olives, homemade piri-piri (warning: it is extra spicy!) and of course tremoços, or lupine beans, which are very common bar snacks in Portugal to accompany a cold beer. Attracting the longest queues are the charcuterie stalls – the cheeses (cow, sheep and goats cheese) are mostly from the Alentejo region, but there is a large variety of locally produced enchido sausages, including blood chouriço, black and white pork sausages, morcela and alheira, as well as the famous cured ham, called presunto. The farmers’ market is popular all year round, but there is more variety and quantity during the summer months. While its opening hours are from 7am to 1.30pm, it is worth arriving early in the morning to ensure parking is possible and to get first dibs on the best produce. At Saturday markets, the early bird really does catch the worm.